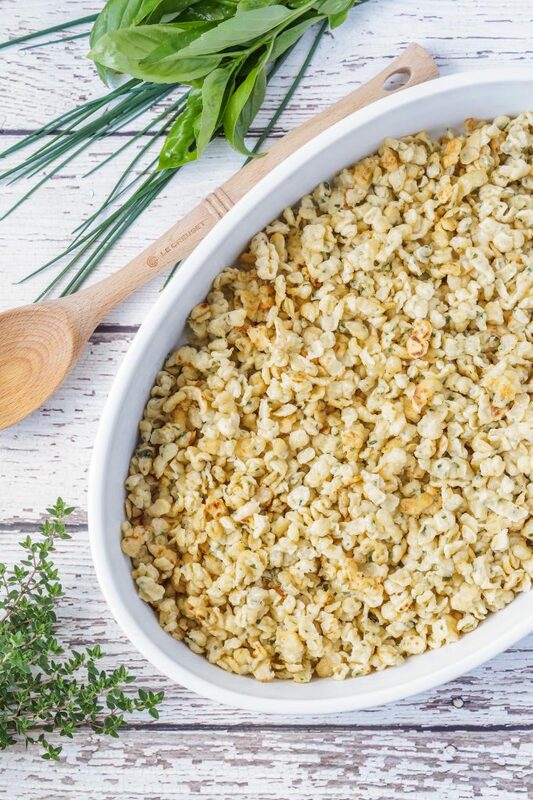 Kräuterspätzle is a great summer recipe to help trim back some of the herbs growing in your garden. 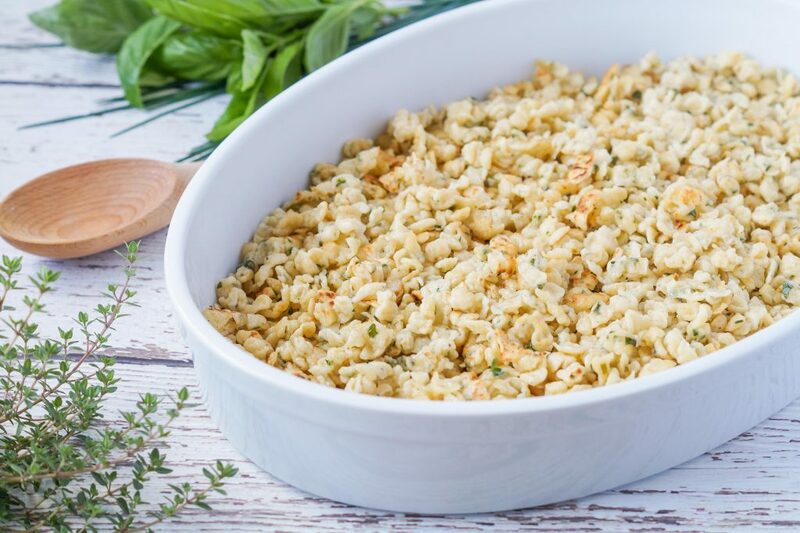 Finely chopped, fresh herbs are mixed into a basic Spätzle (German pasta dumpling) dough before pressing through a Spätzlespresse (Spaetzle Maker) into the boiling water. 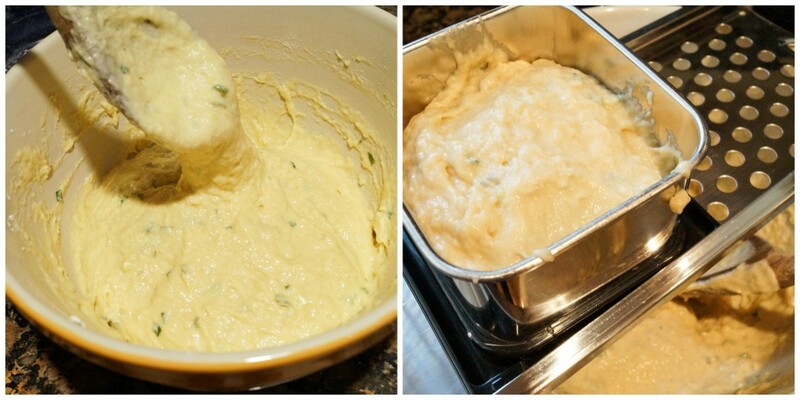 I added a mixture of chives, basil, and thyme to the dough, but use any combination of your favorite herbs. The original recipe called for 3 tablespoons chopped herbs. That just didn’t seem like enough to me, so I doubled it to 6 tablespoons. I used this Spaetzle Press to make the Kräuterspätzle. If you don’t have one, pushing the dough through a large-holed colander with the back of a wooden spoon will also work. The Spätzle can be served simply boiled with a little butter on top or you can take it a step further and pan-fry the cooked dumplings in butter to get crisp, golden edges. I also used this recipe as the base for my Spätzlesalat (German Spaetzle Pasta Salad). In a large bowl, combine flour, desired amount of herbs, and salt. Make a well in the center and add eggs. Beat them with a wooden spoon and stir into the flour. Slowly add the water until a dough, slightly thicker than pancake batter, forms. Bring a large pot of water to a boil. Place a spaetzle press or large holed colander over the pot and fill with batter. Slide the press back and forth or use a wooden spoon to press the batter through the holes of the colander to create the dumplings. Stir gently to remove any pieces from the bottom of the pot. Cook until they float to the top, remove with a strainer, and drain. Serve with immediately with butter or pan-fry. Are you adding the chopped herbs to the batter before cooking, or sprinkling them over the cooked spätzle? Hi Katja! I mixed them right into the dough. I often sprinkle a little more on top for garnish as well. Mmmmm. This reminds me of my grandmother! She used to make this dish regularly! This looks delicious and beautiful! Such a novel idea! Enjoyed reading about world cuisine. I haven’t had this. Looks so good! I definitely want to make my own.